Clyde Haase took a favorite poem (author unknown) of Janet Wiggers, created a design and cross stitched it for her and had it framed. 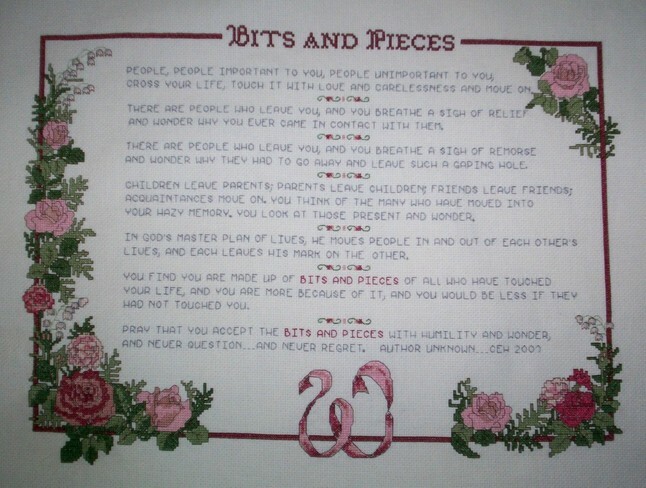 The poem is about relationships and the people who come in and out of our lives and hopefully, we appreciate all the “bits & pieces” that makes us who we are and that everyone contributes to the “bits & pieces" of our life. This poem has a very special meaning to Janet and the work that Clyde did for Janet was a labor of love. This piece was displayed at the reunion but in case you didn't get a chance to see it, now is your chance. Thank you to Janet & Clyde for sharing this with all of us.